This is part 3 of my performance report for sysbench and MyRocks. For this test I use a large server (24 cores, 48 threads, fast NVMe SSD). A small server was used for part 1 and part 2. This test is done with a small and cached database - 8M rows. InnoDB is a great choice for such a workload. I am not surprised that MyRocks and TokuDB are not great at this workload. The value for MyRocks and TokuDB is better compression and less write-amplification and that usually requires a larger database and the benefit grows when the database doesn't fit in RAM. But early evaluators might use sysbench so I want to understand how they perform in this setup. The common pattern was InnoDB was faster than MyRocks and MyRocks was faster than TokuDB. InnoDB in MySQL 5.7.10 is much faster than in MySQL 5.6.26 on tests that are write-heavy or have long range scans. But InnoDB in 5.7 isn't strictly faster than in 5.6 even at high concurrency. MyRocks suffers on tests with longer range scans but did pretty good for point queries. TokuDB was the slowest for all of the workloads except read-write with --oltp-range-size=10000 and read-only with --oltp-range-size in 100 and 10000. Percona fixed a bug in TokuDB that I reported. Thank you. It can be interesting to compare this result with the result from the smaller servers I use at home. The smaller server has a slower CPU (core i3) and slower SSD. Unfortunately I need to repeat tests on my work servers using the latest version of sysbench. I used version of sysbench that is a few months old with an older version of my scripts. For my home servers I upgraded to modern sysbench and I will soon do that at work. I will also upgrade from MySQL 5.7.10 to a more recent version and that should make a famous MySQL support guru happy. The test server has 24 cores, 48 threads, 2 sockets and 256gb of RAM. The storage is from multiple NVMe SSDs. I tested 4 engines -- myrocks-5635 is MyRocks from FB MySQL merged to upstream MySQL 5.6.35, innodb-5626 is InnoDB from upstream MySQL 5.6.26, innodb-5710 is InnoDB from upstream MySQL 5.7.10 and tokudb-5717 is TokuDB from Percona Server 5.7.17-11. The my.cnf files are here for MyRocks, InnoDB-5.7 and InnoDB-5.6. In all cases the binlog is enabled and fsync is disabled for both the storage engine redo log and the binlog. low concurrency (<= 8 clients), medium concurrency (16 to 40 clients) and high concurrency (>= 48 clients). The test was run at each concurrency level for 180 seconds for read-heavy tests and 300 seconds for write-heavy tests. The sysbench process is run on the same host as mysqld. prepare - this isn't a test, it creates and loads the tables. There were 8 tables with 1M rows per table. The sysbench table has one secondary index. For the performance summaries below I use "X >> Y >> Z" to mean X is faster than Y and Y is faster than Z. I did not include graphs for one or both of 1) that is a lot more work and 2) I want some readers to take the time and think about the numbers. Unfortunately the formatting is not great for a wide table. The numbers in the table are the QPS for 1 to 128 threads. 1 to 8 clients - MyRocks >> InnoDB-5.7 >> InnoDB-5.6 >> TokuDB. I don't know why MyRocks was lousy for 1 client but OK for 2+. 1 to 8 clients - InnoDB-5.6 >> InnoDB-5.7 >> MyRocks >> TokuDB. I don't know why MyRocks was lousy for 1 client but OK for 2+. 16 to 40 clients - InnoDB-5.7 >> InnoDB-5.6 >> MyRocks >> TokuDB. This is part 2 of the performance report for sysbench, MyRocks, InnoDB and a small server. The first part covered an IO-bound workload where the database was larger than RAM. This part covers a cached workload where the database fits in the MyRocks block cache and InnoDB buffer pool. 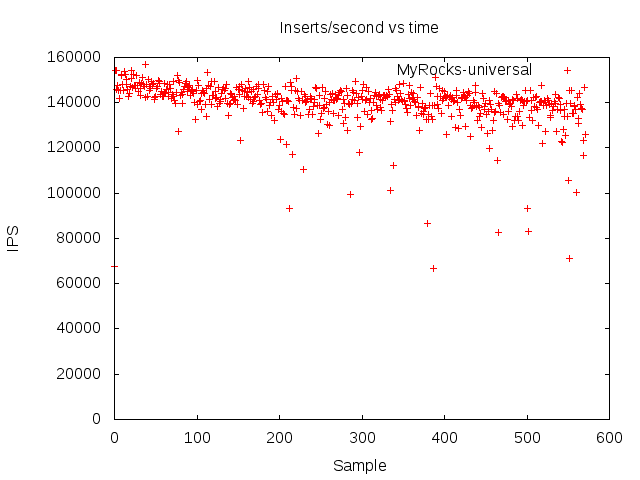 MyRocks is faster than InnoDB in the write-heavy tests. InnoDB in MySQL 5.6 is faster than MyRocks in the read-heavy tests. I can't reproduce this on the newer/faster CPUs I use at work. For this test I used an Intel NUC with a 5th generation core i3 CPU. I am still trying to figure this out. 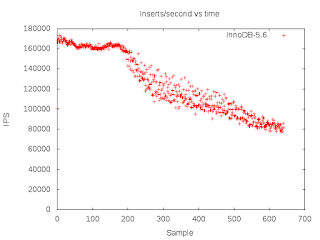 InnoDB in MySQL 5.6 is faster than in 5.7 for most write-heavy tests. InnoDB in MySQL 5.7 is faster than in 5.6 for most read-heavy tests. I am curious why this depends on read-heavy vs write-heavy. The previous blog post has all of the details and and shared results for the IO-bound test that used 4 tables with 40M rows per table. This test used 4 tables with 1M rows per table. Tests are run for 3 storage engines - MyRocks from FB MySQL merged to upstream MySQL 5.6.35 (myrocks-5635), InnoDB from upstream MySQL 5.6.35 (innodb-5635) and InnoDB from upstream MySQL 5.7.10 (innodb-5710). The sequence of tests is the same as described in the previous blog post. The numbers in the table are the QPS for 1, 2 and 4 threads. MyRocks is faster than InnoDB because secondary index maintenance is write-only (read-free). On the IO-bound test that avoided stalls from page reads. Here it saves on CPU. InnoDB in MySQL 5.6 is slightly faster than MyRocks. The update statement in this test doesn't require secondary index maintenance so MyRocks loses that benefit. InnoDB in MySQL 5.7 is much faster than in 5.6. I think something was done to make range queries more efficient in 5.7. InnoDB is a lot faster than MyRocks. On my work servers with newer/faster CPUs I don't reproduce this and am still trying to understand the cause. I used sysbench to compare MyRocks and InnoDB on a small server. I ran tests for an IO-bound and in-memory configuration and share results for the IO-bound setup here. On some workloads InnoDB is faster than MyRocks but this does not reproduce on the faster/newer CPUs that I use at work. 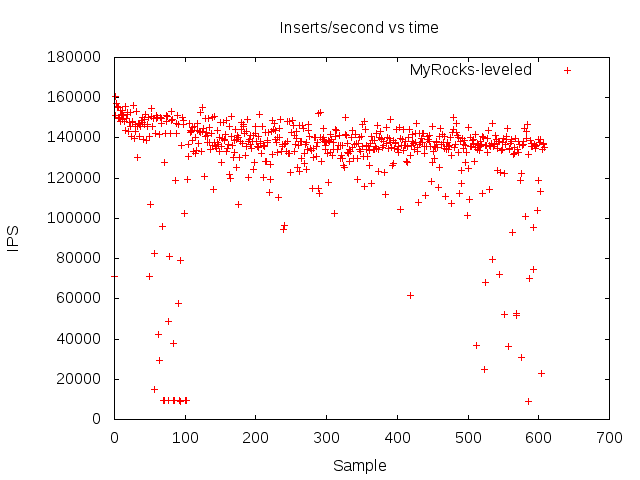 I wasn't able to explain this but it looks like the memory-latency bound functions in RocksDB account for more of the CPU overhead on my home servers. Maybe I need to try Intel vTune, I just wish it didn't cost $899. Performance with the default my.cnf is very good for all of the engines. The optimized my.cnf is more useful on the larger servers I use at work. One change in the optimized my.cnf increases the RocksDB page size from 4kb to 16kb which can hurt throughput on IO-bound workloads. MyRocks did much better on inserts, updates and deletes. InnoDB did much better on range scans and better on point selects. There are some changes in MySQL 5.7 that makes range scans faster. The goal for MyRocks is much better space & write efficiency than InnoDB (use less SSD, SSD lasts longer) with similar or good-enough read efficiency. We achieved the space and write efficiency goals. There is more work to be done for read efficiency. There isn't much of a difference for InnoDB between MySQL 5.6.35 and 5.7.10. The difference is more obvious on workloads with more concurrency using larger servers. There is little overhead from compression with MyRocks. There is a lot with InnoDB, especially on write-heavy tests where uncompressed InnoDB is much faster than compressed InnoDB. The small server is an Intel NUC (NUC5i3ryh) with a 5th generation core i3 that runs at 2.1GHz. I use these at home because they are small, quiet, efficient and affordable. The server has 2 CPU cores, 4 with HT enabled, 8G of RAM, a 110gb Samsung 850 EVO m.2 SSD and a 7200 RPM disk. The OS is Ubuntu 16.04. Tests are run for three storage engines. The first is myrocks-5635 which is MyRocks from FB MySQL merged to upstream MySQL 5.6.35. The second is innodb-5635 which is InnoDB from upstream MySQL 5.6.35. The third is innodb-5710 which is InnoDB from upstream MySQL 5.7.10. Command lines for cmake to build each binary are here. The test was repeated three times for each engine: with the default my.cnf, with an optimized my.cnf and no compression and with an optimized my.cnf and zlib compression. This test is the IO-bound configuration with 4 tables and 40M rows per table. The database is larger than RAM but my test scripts didn't record the database size (need to fix that). myrocks-5635 - the my.cnf files for MyRocks are here. Snappy compression is used for all levels in the default my.cnf. For the optimized my.cnf with zlib compression there is no compression for L0-L2, LZ4 compression for L3 to the next to last level and then zlib for the last level of the LSM tree. Prior to the insert-only tests the database was ~34gb without compression and ~18gb with zlib compression. Compaction IO stats are here, but suffers from a bug that is fixed but not yet in my build. innodb-5635 - the my.cnf files for InnoDB in MySQL 5.6.35 are here. innodb-5710 - the my.cnf files for InnoDB in MySQL 5.7.10 are here. innodb-5717 - the my.cnf file for InnoDB in MySQL 5.7.17 is here. In this post I don't share results for 5.7.17 but future posts use it. innodb-801 - the my.cnf file for InnoDB in MySQL 8.0.1 is here. In this post I don't share results for 8.0.1 but future posts use it. The benchmark client is modern sysbench although I have begun to use my fork. This is run by a helper script that uses a sequence of workloads via bundled lua scripts. All tests use the uniform distribution except for update-nonindex-special. The default in sysbench is a skewed distribution. But skew means that IO-bound tests (database >> RAM) are less IO-bound because there are more cache hits. So I switched. update-one - each update statement updates one row. The same row in the database gets all updates. update-index - uses oltp_update_index.lua to run an update-only workload and secondary index maintenance is required. MyRocks does better on this test because non-unique secondary index maintenance is read-free for it. delete - uses oltp_delete.lua to run a sequence of delete row, re-insert row operations. Upstream doesn't use transactions (yet) but the diff to fix that is small. write-only - uses oltp_write_only.lua to get of the writes but none of the reads from oltp_read_write.lua. I have stopped running this test. read-write.rangeX - uses oltp_read_write.lua --range-size=X. I set X too 100 and then 10,000.
read-only.rangeX - uses oltp_read_only.lua with --range-size=X. I set X to 10, 100, 1000 and then 10,000. I have changed to only run this for X set to 100 and 10,000. The read-only.range10000 is also run before the update tests so the performance can be measured before fragmentation. The test run before updates is called read-only.pre. point-query - uses oltp_point_select.lua. The workload is to fetch all columns in one row by primary key. This test is run before and after the update tests so the performance can be measured before fragmentation. The test run before updates is called point-query.pre. random-points - uses oltp_inlist_select.lua. Each select statement fetches 100 rows found by exact match on the PK using an in-list. This test is run before and after the update tests so the performance can be measured before fragmentation. The test run before updates is called random-points.pre. scan - this does a full scan of the primary index and is done before and after the update tests to determine the impact from fragmentation. hot-points - uses oltp_inlist_select.lua. Each select statement fetches 100 rows found by exact match on the PK. This is similar to random-points except this fetches the same 100 rows for all queries. The working set for this test is always cached. Several of the read-heavy tests are run before and after the write-heavy tests. That is done to understand the impact of fragmentation on query efficiency as the database is fragmented by the write-heavy tests. Some of the read-heavy tests can be slower if the database is still doing B-Tree write back or LSM compaction, and that can happen for tests run before and after the write-heavy tests. While the read-heavy tests are run before the write-heavy tests, they are still run after the load which is also write-heavy and the script above doesn't do much to wait for writes to stop after the load. Compressed InnoDB is worse than uncompressed InnoDB. The per-index mutex might be the largest problem. This isn't explained by (de)compression latency. MyRocks is best but the difference with InnoDB is smaller because no engines have to do secondary index maintenance for this test. Compressed InnoDB is much worse than uncompressed InnoDB. The per-index mutex might be the largest problem. The numbers in the table are the QPS for 1 thread. I can't use more threads until I update the test script to use transactions for each delete/reinsert pair. MyRocks is best. That might be because secondary index maintenance is write-only (read-free). Compressed InnoDB is much worse than uncompressed InnoDB, perhaps because of the per-index mutex. Compared to oltp_read_write.lua with --range-size=100, the bottleneck here switches from writes to reads and InnoDB is faster than MyRocks for long range scans. Compressed InnoDB is much worse than uncompressed InnoDB. The largest problem might be the per-index mutex but another problem is (de)compression latency. InnoDB in MySQL 5.7 is much faster than in 5.6. InnoDB is faster than MyRocks because of the read overhead from an LSM. 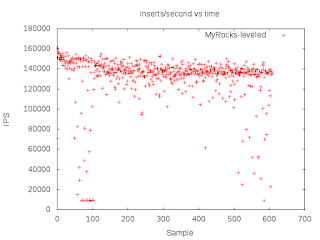 MyRocks QPS on the read-only tests has extra variance because the state of the memtable (number of keys) and L0 (number of files) has more variance when the read-only test follows write heavy tests. On this test InnoDB does better than MyRocks on my older/slower CPU (5th generation core i3) that I have at home while MyRocks does better on newer Intel Xeon CPUs I get at work. Compressed InnoDB is worse than uncompressed InnoDB. I assume this is decompression latency. 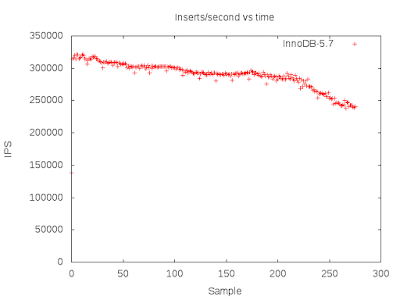 InnoDB in MySQL 5.7 is faster than in 5.6. Something was done to make range scans faster. Compressed InnoDB is slower than uncompressed InnoDB. I assume this is decompression latency. 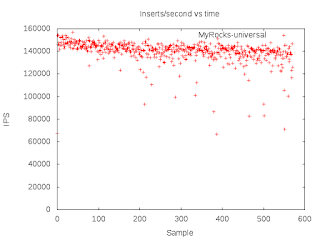 MyRocks is faster perhaps because secondary index maintenance is write-only (read-free). Compressed InnoDB is slower than uncompressed InnoDB. I assume this is from both the per-index mutex and (de)compression latency. This is yet another result to understand an insert-only workload. In this case the database is small enough to be cached by the storage engine. Previous results were explained here, here and here. From several tests it is apparent that MyRocks and InnoDB from MySQL 5.6 have similar throughput while InnoDB from MySQL 5.7 does much better for cached & insert-only when the server has fast SSD. In this result I changed a few options to reduce the chance that compaction stalls will occur with MyRocks. I increased level0_slowdown_writes_trigger to 20 and level0_stop_writes_trigger to 30. I also ran tests with universal compaction. We probably have some work to do here -- improving default option values and making compaction throttling less spiky. Disabling the binlog helps MyRocks more than InnoDB. We have work in progress to make binlog processing faster for MyRocks. MyRocks with leveled compaction and the binlog is limited by compaction stalls in moving data from level 0 to level 2. Note that MyRocks did great when able to avoid the bottlenecks from binlog processing and compaction stalls. That is apparent in the result for universal compaction with the binlog disabled. For this test I inserted 400M rows using the insert benchmark. The test was run for 1, 2, 4, 8, 12 and 16 concurrent clients. There was a table per client and each table has 3 secondary indexes. The inserts are in PK order. The database cache was large enough to cache the database. Tests were repeated with the binlog enabled and disabled. For MyRocks I used a build from November 21 to match what was used in previous tests. For MyRocks I also ran tests with leveled and universal compaction. This is the first time I tried universal compaction with MyRocks. The numbers in the table below are the average insert rate, larger is better. These graphs show the row insert rate per 5 second interval for the test with 16 clients. 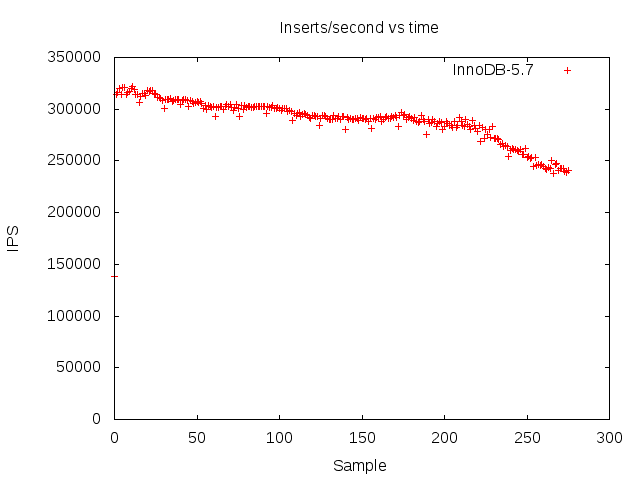 The graph for InnoDB-5.7 ends earliest because it finishes the load first. The graph for MyRocks with leveled compaction has the most variance when ingest is faster than compaction from level 0 to level 2. 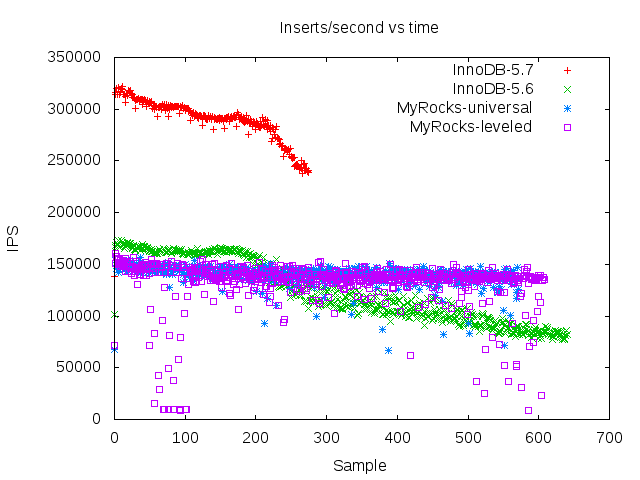 Ignoring the variance, MyRocks throughput declines less over time than InnoDB. The next graph is for InnoDB-5.7. While throughput declines over time there is not much variance. The next graph is for InnoDB-5.6. 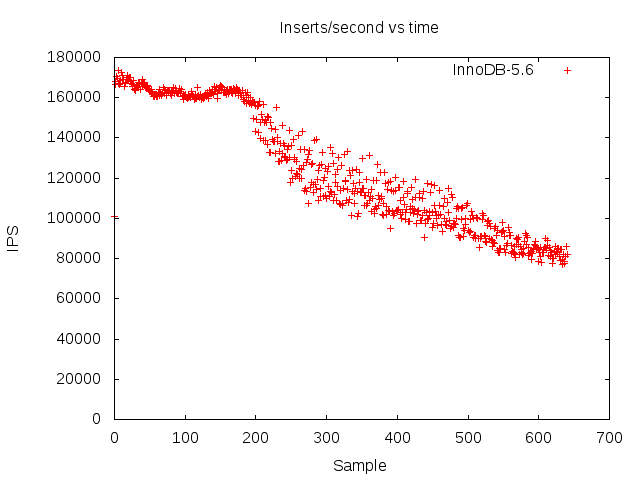 It has more variance and loses more throughput over time compared to InnoDB-5.7. MySQL has been busy making InnoDB better. The next graphs are for MyRocks with leveled and then universal compaction. There are more stalls with leveled compaction. The average throughput is similar and binlog processing is the bottleneck. We have work in progress to improve leveled compaction and the overhead from the binlog. This is yet another attempt to explain why MyRocks is interesting. MySQL continues to get more popular and should soon become #1 on the db-engines ranking. Popularity isn't the only thing about MySQL that is improving -- performance, manageability and availability are also much better and cloud vendors, especially Amazon, are doing remarkable work to make MySQL in the cloud much easier than it used to be. While Oracle has been a great owner of MySQL we still benefit from external contributions to the core DBMS. But new storage engines are unlikely, even ones that had great promise like TokuDB and PBXT, because the storage engine API is hard to implement. I am surprised and thrilled by the progress we are making with MyRocks. It is in production for us today and I expect it to be in production elsewhere within the next 12 months. I am grateful to work with talented teams (MyRocks, MySQL & RocksDB) and understanding management. Efficient performance is the reason for MyRocks. We want to provide performance similar to InnoDB but with much better storage efficiency. The technical message is that MyRocks has less space and write amplification than InnoDB without sacrificing too much read amplification. For a workload I care about it uses 1/2 the space and writes at 1/10 the rate of InnoDB. The less technical message is that with MyRocks a deployment needs less SSD and the SSD will last longer. The other important question is when to use MyRocks. My goal is for MyRocks to be an alternative to InnoDB for any workload where the database is larger than RAM. While we have optimizations for in-memory workloads with RocksDB I don’t focus on that today. I also assume that too many workloads use too much RAM today. If you have fast storage with SSD and the database fits in RAM then you probably have too much RAM. So my pitch is to use more fast storage and less RAM and use less space, less power and possibly fewer servers.